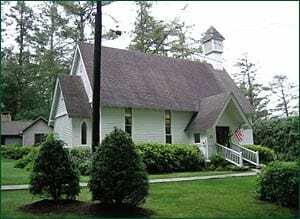 Wee Kirk Presbyterian Church is located in the small mountain community of Linville, NC. Established in 1895, the Wee Kirk has been an important religious sanctuary for all those who come to this charming resort village in northwestern North Carolina on the Blue Ridge Parkway. Spread the word . . . the Gospel, the Good News! . . . to the resort communities in Linville NC and the surrounding Avery County area. Minister to our Guest Ministers and their families by providing friendship and a one-week summer retreat from their full-time ministerial profession, including the use of the Wee Kirk Presbyterian Church manse in Linville, NC. Minister to the needy and worthy children in Avery County through the Wee Kirk “Neediest Kids” Outreach Program. This highly effective effort is administered principally through the Avery County public school system, the “Volunteer Avery County” organization, and the Crossnore School.